Before we can understand auroras, we need a few facts about the space around our Earth. There are many things in this space that we can't see. One thing is the air we breathe, our atmosphere. It is really a mixture of several gases, mostly nitrogen and oxygen, with traces of hydrogen, helium and various compounds. Another thing we can't see is a magnetic field that surrounds the Earth. If you've ever played with a bar magnet and iron filings you've seen the curved patterns the filings form in the magnetic field. 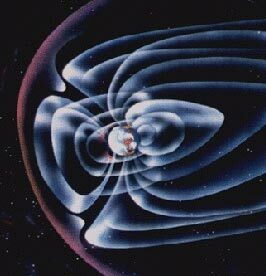 The next picture shows how the magnetic field around the earth's core is like the field of a bar magnet. The Earth's "magnet" is deep in the core. Since we can't see the magnetic field, we draw lines to represent it. The field lines go into and out of the Earth around the Earth's magnetic poles. Where the lines are closest together the field is strongest. Where they are furthest apart it is weakest. Can you tell where the magnetic field is the strongest? Where is it weakest? A third invisible thing in the space around the Earth is a plasma, made of lots of charged particles. There are always electrons and positive ions in the surrounding magnetic field. Charged particles in a magnetic field move in a special way: they are guided by the field. The particles travel along magnetic field lines as if they were wires, circling around the lines in a long spiral as they go. Charged particles are the "ammunition" of an aurora. The short answer to how the aurora happens is that energetic electrically charged particles (mostly electrons) accelerate along the magnetic field lines into the upper atmosphere, where they collide with gas atoms, causing the atoms to give off light. But why does that happen? To find the answer, we must look further away, to the Sun. The spectacular, "great" auroras in "What do they look like?" are powered by what is called the solar wind. The Sun also has an atmosphere and a magnetic field that extend into space. The Sun's atmosphere is made of hydrogen, which is itself made of subatomic particles: protons and electrons. These particles are constantly boiling off the Sun and streaming outward at very high speeds. Together, the Sun's magnetic field and particles are called the "solar wind." This wind is always pushing on the Earth's magnetic field, changing its shape. You change the shape of a soap bubble in a similar way when you blow on its surface. We call this compressed field around the earth the magnetosphere. The Earth's field is compressed on the day side, where the solar wind flows over it. It is also stretched into a long tail like the wake of a ship, which is called the magnetotail, and points away from the Sun. Squeezing the Earth's magnetic field takes energy, just the way it takes energy to compress a balloon with air in it. The whole process is still not fully understood, but energy from the solar wind is constantly building up in the magnetosphere, and this energy is what powers auroras. So we have the Earth's magnetosphere, with the solar wind squeezing the magnetosphere and charged particles everywhere in the field. Solar particles are always entering the tail of the magnetosphere from the solar wind and moving toward the Sun. Now and then, when conditions are right, the build-up of pressure from the solar wind creates an electric voltage between the magnetotail and the poles, like the voltage between the two terminals of a battery. It can reach about 10,000 volts! The voltage pushes electrons (which are very light) toward the magnetic poles, accelerating them to high speeds, much like the electrons in a TV picture tube that accelerate to hit the screen. They zoom along the field lines towards the ground to the north and south, until huge numbers of electrons are pushed down into the upper layer of the atmosphere, called the ionosphere. In the ionosphere, the speeding electrons collide violently with gas atoms. This gives the gas atoms energy, which causes them to release both light and more electrons. In this way, the gases of the ionosphere glow and conduct flowing electric currents into and out of the polar region. The electrons flowing back out don't have as much energy as the speedy incoming ones had - that energy went into creating the aurora! The way the aurora works is a lot like a neon sign, except that in the aurora, the conducting gas is in the ionosphere, instead of a glass tube, and the current travels along magnetic field lines instead of copper wires. What Makes Auroras Happen? Listen to David Stern of NASA's Goddard Space Flight Center. To Listen to this clip you will need the RealAudio player.